Thanks to a most inspirational blogger and French Culinary School student in London at Foodbeam, I was inspired to try my very first French pastry made from scratch. I have a secret and deep-rooted desire to attend pastry school and spend my days making indulgent baked treasures for friends and family. Until life allows me that luxury, I live vicariously through little projects at home whenever I get the chance. In laymen’s terms, this a Danish braid. 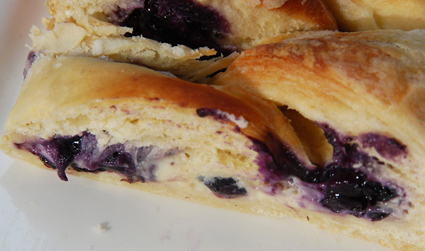 And yes, it can be used to make Danishes much like you would buy at the donut shop. But if you are expecting the typical dry flaky texture, get ready to have your socks knocked off! I’ve never tasted a softer, more moist pastry dough in my life. Here’s how it came together. The original recipe called for a vanilla pastry cream filling sprinkled with chocolate chips. I chose a ricotta lemon cream cheese filling with blueberries instead. The fun of this recipe is that you can choose almost any filling you like. Someday I will try making one filled with Nutella, perhaps another with Cinnamon Vanilla pastry cream, or even a savory variety with herbed cheese and sun-dried tomatoes. The options limitless! My new best friend in the kitchen is my digital scale. The more advanced the recipe, the more often I find the portions are measured in grams and ounces. I’ve come to learn that using measuring cups and tablespoons are far less accurate. The ingredients can be dramatically impacted by the humidity, temperature, altitude, and even your scooping technique and the results can be quite varied. This recipe is no exception. I’ve also found that it is much easier to throw a bowl on a scale and dump things in until I get to the correct weight as opposed to scooping, leveling and trying to keep count of how many cups of what I’ve added. There is also build-up of dirty measuring cups that need to be washed over and over again. The original blog post on Foodbeam also has step-by-step photos and instructions you may want to check out. The following is what my baking process looked like. One of many things I learned is that pastry dough is not one recipe, but two separate mixes that are layered and folded and re-folded together to make one sheet of dough. 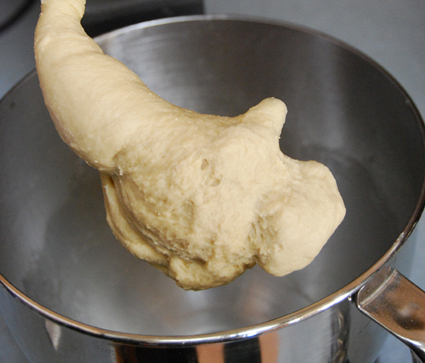 The photo above is the first half of the dough called the “détrempe” or egg-based yeast dough. The second mix is called “buerre manié” which is simply butter mixed with a little flour. Once the dough and butter mixtures are complete, the layering began. I first rolled out the yeast dough into a large rectangle and spread the top 2/3 with the butter mixture. Then it was folded in thirds as shown in the photo above and set in the fridge to chill for 30 minutes. This folding process is called “turning” the dough. Once chilled, the dough was turned and refrigerated again. This process was repeated 3-4 times throughout the course of the day with the final refrigeration lasting 3 hours. As the dough was on its final chill in the fridge, I made my lemon-ricotta and blueberry fillings. Combine blueberries and sugar in a small saucepan. Mash blueberries as you heat the mixture and bring it to a boil. Once bubbling, add the conrstarch mixture and cook until it thickens. Remove from heat and let cool until it has a jelly -like consistency. Place the cream cheese and sugar in the bowl of an electric mixer fitted with a paddle attachment and cream them together on low speed until smooth. With the mixer still on low, add the egg yolks, ricotta, vanilla, salt, and lemon zest and mix until just combined. Don’t whip! I rolled the dough out into a large rectangle and made horizontal cuts along the outer third of each side. These strips will eventually create the braided effect. Next I spooned in the filling down the middle. Before beginning to “braid”, I folded up the dough at each end of the braid. This helps to keep all of the filling goodness inside the braid and not leak out when in the oven. Now for the braid: I went back to the top and alternated sides folding the side strips in towards the middle and covering the filling. The dough strips should overlap in the middle. You may want to wet it a bit to make sure that the strips stick to each other as you go. Otherwise the braid may fall apart in the oven and things will not look so pretty. 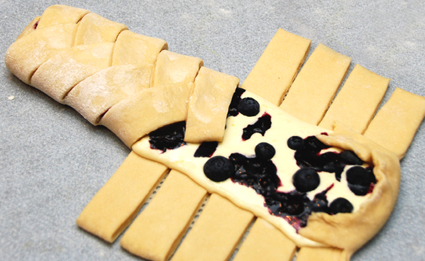 To bake the braid, you can lay it out flat on a baking sheet, or use a long loaf pan. Using a loaf pan helps to keep the sides nice and straight and the braid will have a little more height. I wanted this effect but didn’t have the right size pan, so I grabbed a ceramic casserole dish and built a make-shift divider out of aluminium foil supported with a damp rolled towel to hold it up. It worked beautifully! I was hesitant to bake the braid and serve it without adding any glaze or topping, but I was very happy that I refrained. The braid baked beautifully and the flavors from the creamy filling and dough were so magical, any anything else would have ruined it. Combine the flour,yeast, sugar and salt in a bowl. Mix in the milk, egg and vanilla extract. When the ingredients have been incorporated, start kneading the dough until it becomes smooth and easy to work with, around 5 to 7 minutes. You might need to add more flour if the dough is sticky. Form into a rough rectangle, wrap in cling film and chill for 30 minutes, while you get on with the butter block. Cream the butter and flour. Shape into a rectangle and wrap in cling film. 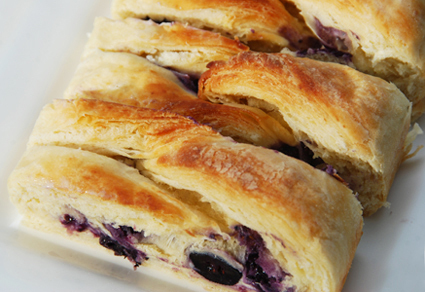 You now have a little spare time, just enough to make the crème pâtissière (recipe below). After the détrempe has chilled 30 minutes, turn it out onto a lightly floured surface. Roll the dough into a rectangle approximately 20 x 30 cm and 1cm thick. Spread the butter evenly over the centre and right thirds of the dough. Fold the left edge of the détrempe to the right, covering half of the butter. Fold the right third of the rectangle over the center third. The first turn has now been completed. Mark the dough by poking it with your finger to keep track of your turns. Wrap the dough in cling film, and refrigerate for 30 minutes. Place the dough on a floured work surface – the spine (picture a book spine) should be on your left. Roll the dough into another approximately 20 x 30 cm rectangle, and proceed with a tour double (what is a tour double? ): visualise the middle axis of the rectangle, grab the lower end of the dough and fold it over so it meets the middle axis. Do the same with the upper end. I’ll call this an open book. Finally, close the ‘book’ and wrap it in cling film. The second and third turns have now been completed. Refrigerate the dough for 30 minutes. Do a final simple turn: place the ‘book’ in front of you, spine on the left and roll it into a rectangle slightly larger than a sheet of A4 paper. 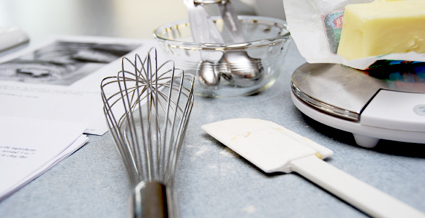 Brush the excess flour away and fold in three, just like you would do with a business letter. Wrap in cling film and chill for at least 2 hours; however, I tried with a short 20 minute rest and it worked perfectly. On a lightly floured surface, roll the Danish dough into a 20 x 30 cm rectangle, approximately 1/2 cm thick. Transfer onto baking paper. Along one long side of the pastry make parallel, 10cm long cuts with a knife, each about 2cm apart. Repeat on the opposite side, making sure to line up the cuts with those you’ve already made. Pipe the filling down the centre of the rectangle, and sprinkle with chocolate chips. Starting with the top and bottom flaps, fold the top flap down over the filling to cover. Next, fold the bottom “flap” up to cover filling. This helps keep the braid neat and helps to hold in the filling. 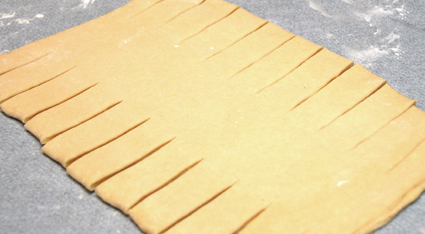 Now begin folding the cut side strips of dough over the filling, alternating first left, then right, left, right, until finished. Tuck in the ends. 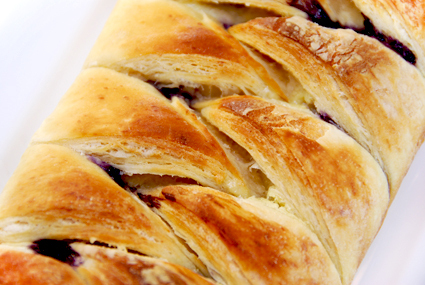 You can either place the braid into a loaf pan, or leave it rest onto a baking sheet. Both ways, allow the braid to double in size at room temperature, for 1 to 2 hours. Preheat the oven to 200°C and bake the braid fopr 10 minutes; turn around, lower the oven temperature to 180°C, and bake for a further 20 minutes, or until golden. Your danish bread looks amazing! I love making danish pastry dough. I remember seeing the recipe on foodbeam’s blog and her informative drawings of the process. You did a fantastic job! you did an amazing job! you should be very very proud!